In the season most famous for stunning cherry blossom, come and discover the specialities of Sapporo for yourself. Explore the places, the culture, the food, the people and the language. In order to give you the most exciting chance to discover Japan, Hokkaido JaLS has designed a course filled with cultural lessons, activities and language study. We are small and warm Japanese school offering many great experiences that we can enjoy together. * It is possible to begin on any Monday and graduate on any Friday. * You can participate for as little as one week. Please check the detailed schedule for more information. Spring Course pamphlet. In Sapporo, Spring means that cherry and plum blossoms will flower at the same time. Throughout Japan, this is unusual, and this unique beauty is only seen in Hokkaido and Tohoku. It’s a really special experience. In addition, in the mountains around Sapporo you can enjoy Spring skiing and snowboarding because the snow remains until late in the year. This incredible contrast of warm and cool weather, snow and fresh flowers makes Spring in Hokkaido particularly beautiful. For more information on Hokkaido please go to the Hokkaido information page. Japanese Lessons at Hokkaido JaLS. At Hokkaido JaLS, we have tailored our curriculum to promote active usage of Japanese during your short stay in Japan. In order to improve your Japanese conversational skills within a short period of time, we focus on three main areas – practice, speak and use! The classes at Hokkaido JaLS are designed for a maximum of 6 people in each class. This way, our teachers are able to coach our students individually, giving you plenty of chance to clarify doubts and practice Japanese. After class, students are encouraged to use Japanese actively out of school and on the streets of Sapporo! 2.Using the new grammar and vocabulary while shopping! 3. Write, draw, create a report! At Hokkaido JaLS, students get many chances to use Japanese outside of the classroom. Every day, we have a mini event for JaLS students, staff, students from local universities, and working adults from Sapporo to meet, interact and have fun together. 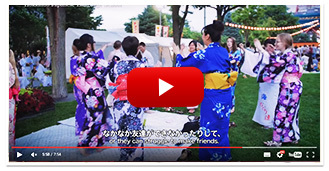 It’s a great way for you to practice Japanese and make new friends! We strongly encourage our short-term students to participate in the after-class activities. By speaking to our volunteers in Japanese, your language skills will advance rapidly and you will be able to enjoy speaking Japanese!